Ringo's artwork is on view this weekend; buy it & meet him Saturday . Beatles Radio: The Beatles, Solos, Covers, Birthdays, News The Fab 4 and More! Former Beatle (is one ever really a former Beatle?) Ringo Starr brings his All-Starr Band back to Milwaukee Saturday, Sept. 8 for a show at the BMO Harris Pavilion on the Summerfest grounds, but Starr's talents will be on display here longer than that. 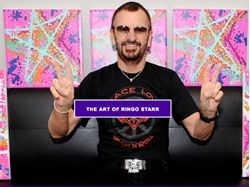 The legendary drummer's artwork – hand-signed by Starr – will be on display and for sale from Thursday through Saturday at Gallery 505, 517 E. Silver Spring Dr., in Whitefish Bay. Some of the work features Starr's own image.